I like learning new things, finding good things, or noticing good around me. These are some of my more recent discoveries. Title Nine’s sports bras: For the last ten or so years, I have lived with perpetual chaffing from a sports bra. I thought it was a fact of being active, sort of like the occasional lost toe nail. But in January, a friend told me that she’d found a bra at Title Nine that really worked for her. I went in and was amazed to learn that they have lots of different kinds of bras and that they let you try them out and return them if you don’t like them. Crazy. I bought two, and one of the two works beautifully for me, so I went back last week and bought two more. $50 on a sports bra seems like a lot, considering I usually buy my workout clothes from Target. But I’m loving that I ran the Austin Marathon with no pain and my chaffing marks are fading. The bras are worth every penny. Real Sports with Bryant Gumbel: I said recently that I don’t need any more new television, but I’m adding this show to my A list. I love sports stories. I love seeing humanity in sports and celebrating people finding a new part of themselves by pushing through a challenge. For example, the current episode includes a story about a woman from Pakistan who left her home to pursue her dream of being a champion at squash and a story about a gay male former rugby player who is now an ice dancer. Both stories are about people embracing themselves in the face of opposition. Bryant Gumbel can be snarky at times, but I enjoy that too. I love this show. Being annoyed tells me something: I’ve been reading this book called Wild by Cheryl Stayed. It’s a memoir about a woman who hiked the Pacific Coast Trail in an effort to find herself. Initially, she annoyed me because I felt like she made the most ridiculous choices that made her life unnecessarily hard. Then my friend Brendan suggested that, when he’s really annoyed by someone, he tries to figure out why he’s annoyed because he always ends up learning something about himself. As I continued to read, I thought about what he said and realized that he’s right. I was hating this woman for making choices about work and men and where to live that I could never make myself. That’s what frustrated me. I envied how carefree she was. I even envied her recklessness a bit. Thinking back, I had an equally strong reaction to Eat, Pray, Love, by Elizabeth Gilbert. I felt like she was chasing men all the time, and that got to me. Maybe I need to revisit that book and figure out why that annoyed me so much. Structure: I’ve mentioned before that I love my new triathlon training program. I was telling my coach Natasha that I’ve dropped weight in the few weeks we’ve been working together. She commented that the more structured we are on one part of our life, the more structured we are all the way around. And she’s right. Since getting on this program where I workout every day and report my progress, I’ve kept up and managed to fit more into my life. I’m working more, writing more, reading more, seeing more friends, and still making time for myself to sit and watch television at times. I love the additional structure in my life. Random stuff, I know. But that’s what’s been going on. And yes, I’m aware of the conflict between what I learned about myself in 3 and what I love in 4. I’m very aware of it. It’s the story of my life. 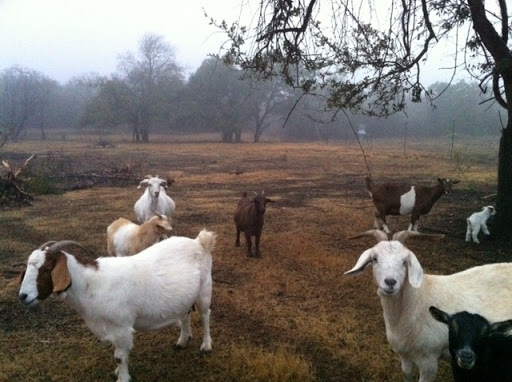 My parents have goats on their property just west of Dripping Springs. The goats have names, which makes them part of the family. This story is about a goat named Cookie and her daughter named Cookie-Ballah. Cookie-Ballah, who is an adult goat, never left her mother’s side. Anywhere Cookie was, Cookie-Ballah would be spotted within feet of her. Cookie was recently pregnant again and had a couple of new babies. (The babies do not have names because my parents won’t be keeping them.) Cookie was taking care of her new babies, and Cookie-Ballah was nearby. When one of the babies went to nurse on Cookie, Cookie-Ballah attacked the baby. Cookie immediately responded in kind to Cookie-Ballah, in defense of her new baby. After Cookie attacked her, Cookie-Ballah started to walk away. She took a few steps towards the larger herd and then stopped and looked back at her mother. She took another few steps and stopped again to look back at her mother. She continued taking a few steps and looking back at her mother until she entered the mix with the herd, separated from her mother for the first time since her birth. I trust when Cookie is done nursing her new babies, she will connect again with Cookie-Ballah. But I hurt for Cookie-Ballah until then. She’s just sitting with the herd, waiting for the one she loves most to want her close again. This week, I’ve been thinking a lot about how to make the most of my time. I’ve been told again and again that I impress people with how much I am able to pack into my days. I do feel like I’m generally good about using my time well. I work. I train. I write. I’m in book clubs and breakfast clubs. As of last month, I host a writing group in my home. I keep up with people I love all across the country. I’m proud of all of these things, and I love doing them. I’ve made some decisions recently to cut back on commitments, and I think that’s really helped me focus myself more. But there is always room for improvement. So how can I better use my time? No more new TV: I already watch General Hospital (do not judge me), Smash, Nashville, The Good Wife and The Voice. I record these shows and rarely get behind on them. I also often watch Glee and Ellen, but sometimes I’m watching them weeks after they happen, unlike my “A” list of shows that must be watched, more often than not, the very night I record them. I’d love to watch Downton Abby, especially given all the Facebook drama I see about it, but I simply can’t. I’d love to go back and watch Mad Men, Lost, Parks and Recreation, 30 Rock or a host of other shows, but no. I am maxed out on television. Maybe I’ll catch these shows in recorded form seasons or years from now. But for now, no more new television for me. Spend More Time on Housecleaning: I find that I’m more productive at home if my space is well kept. If it’s cluttered, then I tend to want to sit on the bed and watch television. But if I can see my dining table, I can see the things I can be doing at that table – things like writing for me, writing for clients, keeping up with my financial records and bills, or writing letters or cards. Also, if my house is clean, I tend to want to spend time there, which often ends up more productive than time spent out. Read More: Reading inspires me to write. When I read something I love, it makes me want to write something someone else will love just as much. When I read something I don’t love, I think, “If this got published, I could be published too.” The best is when I read something written by a friend. Like this past weekend, I read Saving Gracie, which was written by a friend from my old church. I know Kristen. She is a real person with a real talent who found her way to a real publishing contract. The reality of all of that and the beauty of her work make me think that being published isn’t just some illusive dream. It is Kristen’s reality. It can be my reality too. Recommit to Toastmasters: I’ve been a member of Capital City Toastmasters since 2007. The club gives me an opportunity to develop my ability to speak to an audience. It also challenges me to write because, when I am active, I have to deliver prepared speeches. Lately though, I have not been a regular participant at Toastmasters. I have pulled away some out of insecurity and being a little down, but I’m ready to recommit. Toastmasters helps me be more productive and more creative, both of which are important to me. Somehow, I find hours within my week to get ready for my speeches because I want them to go well. I want people to enjoy them, and I want my presentations to be fun for me. I find all kinds of time when my pride is on the line! Go to Bed Earlier. I have been making a conscious effort to get to bed earlier. I like to wake up early to run with friends, take a spin class or swim. It’s hard to wake up at 4:40 a.m. or 5:00 a.m. if I don’t go to bed by 10:00 p.m. or 11:00 at the latest. When I sleep well and wake up on time, I get my workout in and the entire day is off to a good start. That starts up my productivity in a way that sleeping until 7:00 a.m. or 8:00 a.m. never has. I will continue to think on this subject as I continue to make the most of every moment. I have considered reducing my time on Facebook or setting windows of time where I will check and respond to emails or read blogs. I have also considered getting rid of my television altogether. I know I can continue to improve in this area. Online Reporting: With the TriDot Training System, I log into a website to get my workouts, and I log in again to report how they went. I report every day. That’s why I have done each and every workout since the program began. If I skip, I’ll have to report that I skipped. And I don’t want to do that. Challenging Workouts: For the past two Ironman races, I’ve trained from a book. The book told me when to bike, swim and run and for how long. The workouts I get through TriDot give me specific things to do during the workouts. I don’t just swim for an hour; I complete specific drills and sets. I don’t just bike for an hour; I focus on cadence and keeping my heart rate at certain levels. I don’t just run; I do drills, a track workout, or a long workout at a particular pace. It’s wonderful to be so guided through a workout. Nutrition Assistance: As part of the TriDot program, I have access to triathlon intelligence, including intelligence about nutrition, which is critical to success in my races. Thanks to this program, I’m going to try a product called Generation UCAN, which I think will simplify nutrition for me because I’ll be able to take it once every couple of hours instead of having to take something in every fifteen minutes. Since I’m clumsy on the bike, I’d love to not have to eat every fifteen or thirty minutes! Community: I’m part of a team. There are athletes all over the country on this program. Some of them are local, and I’m lucky to get to connect with them sometimes. This weekend, for example, I did a triathlon camp with other TriDot athletes, and they were really nice people. We worked out and had dinner together. We talked training and power meters and weight gain and loss and so many other things. I loved that time with them. Natasha: Most of all, I really adore my coach. She’s a pro. She super fast and equally kind. She cheerleads and supports. She put together a training camp, including form coaches for swimming and running. She gave me food when I told her I’d skipped breakfast. She taught me how to use my new watch. She even encouraged me as she blew by me on the track. I know she’s watching, given the whole online reporting thing, and I know she wants me to succeed. I feel lucky to have her behind me. I’m excited to see how my performance changes with this program. So far, it’s a great fit for me. In fact, I have only one regret about this program. I wish I had started sooner. I had a breakthrough weekend. My coach Natasha organized a weekend training camp. I couldn’t attend each session, but I did attend a session on swim technique and another on run technique. Both were fascinating and somewhat mind blowing. I haven’t had a chance to put the swim work into practice, but we did get to practice our run, and I saw instant improvement. After the run form clinic, my group went to a track and did a workout. We warmed up. Then I did five 400 meter runs. My workout said I was to do the 400s on 3:02. I ran conservatively, just thinking about the form changes we made, and my 400s ranged from 2:10 to 2:18! I wasn’t huffing and puffing. I wasn’t racing. I was just running steadily, contemplating form. Those times blew me away! Then I did an easy run for the remainder of my workout and decided, on a whim, to time myself for a mile. I didn’t push the mile. Again, I just ran easily, contemplating form. My time for the mile was 10:12, which is unheard of for me. Back in late October, I did a timed mile at a super hard effort on fresh legs and did a 9:48. Yesterday, I did a timed mile at an easy effort on legs that had already done 400 repeats and hit 10:12. That number excites me! At the clinic, the form coach told us that she used to run an 8:30 mile and now runs more like a 6:00 or 6:30 mile. At the 8:30 pace, the coach who taught her this technique said, “Why are you running an 8:30? There’s nothing wrong with you.” Interesting, huh? That suggests anyone should be able to run fast if they are healthy and know proper technique. Her times improved drastically. Mine already seem to have improved. I wonder what can happen if I continue to implement the technique we learned. Could I run an 8:30? Better yet, could I run a 7:30 or a 6:30? I intend to keep practicing, so we’ll find out. I’m at home with two of my favorite people in the world, and we’re writing. We’re writing together, each on our own projects, but together. I’m at my happiest when I write. I’ve known that about myself for quite some time. As a kid, I journaled constantly and even started writing the biography of Ralph Macchio, convinced that I could and that doing so would lead to my becoming Mrs. Ralph Macchio. I loved researching him and piecing my research together in what I believed was an act of love and destiny. Those plans didn’t pan out, but my adult self loves that my kid self had that dream and took steps towards it. In my twenties, during law school when I should have been studying the law, I studied screenwriting and produced at least a few mediocre first drafts. I took classes and participated in online critique groups. I spent days and nights watching movies and trying to notice plot development, scenes, the three-act structure, character development and dialogue. Usually, I picked up on those elements, except when the stories so captivated me that I forgot my intention to study and instead just enjoyed the story on the screen. In my thirties, I’ve taken writing classes and workshops on subjects ranging from personal essay to poetry to songwriting to publicity and promotion as they pertain to writing. I’ve taken classes in Austin, and I’ve even traveled to West Texas, New Mexico, North Carolina and, most recently, Washington, for them. I love spending a Saturday, a weekend or a full week in a room full of writers, published and unpublished, learning about writing and actually writing together. In this fortieth year of mine, I want to gift myself with the time to write, so I’ve invited a few friends into my home to spend one Friday night a month with me, just writing. Oh happy home. And happy girl, this one who loves to write. I mentioned the other day that I was reading a book called Do Life in anticipation of the author’s visit to Book People. That visit happened yesterday, and although I had a ton of work to do this weekend and couldn’t really afford the time, I took a break from the office and went to hear Ben Davis speak. I’m so glad I did. I don’t remember how long ago I came across this YouTube video called “My 120-Pound Journey,” but I loved it from the moment I saw it. It made me cry, and I felt like I’d met someone who believed in the same thing I did – the power of big dreams. If you haven’t watched the video, stop and watch it right now. Seriously. Right now. Since seeing the video, I’ve been following his blog, Ben Does Life, so I knew he had gotten a book deal and had a book coming out in December. (It’s a good book, complete with training plans for different kinds of races, so I do recommend it for anyone who needs a little encouragement.) When I got an email from Book People saying that Ben Davis would be visiting the store, I immediately put it on my calendar. He was planning to meet folks for a short run and then do a talk and a signing. I planned to attend both the run and the talk, but I decided to skip the run and just attend the talk so that I could get more work done. 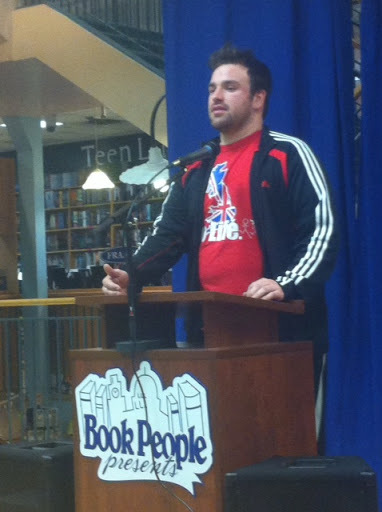 At Book People, he spoke about his journey, his ongoing battle with his weight, and his goals through the Do Life movement. The races Ben did weren’t about weight. They were about happiness and sharing happiness with others. “Find happiness. Don’t just find it but spread it. Do these things, and do them together,” he said. For Ben, “these things” meant workouts, healthy meals, runs, and triathlons – things that one after another felt like the coolest thing he had ever done. He did these cool things with his dad and his brother and then eventually with total strangers all over the country. But for you and me, “these things” could be anything. The point is to get excited about life and to share that excitement with others. Hearing that from Ben was a good reminder yesterday. I think I’ve generally done a good job of putting things on my calendar that excite me, but it’s harder for me to share that excitement with others. Right now, I don’t know who, if anyone, wants to come along, and I find it easier sometimes to just do these things myself. Involving others is stressful. It’s a bummer when people say no, so I often don’t ask. But I need to ask more than I do. I need to allow for the possibility that someone will want to do the things I love to do with me. It’s not just about doing life. It’s about doing life together. Thanks for the reminder, Ben.